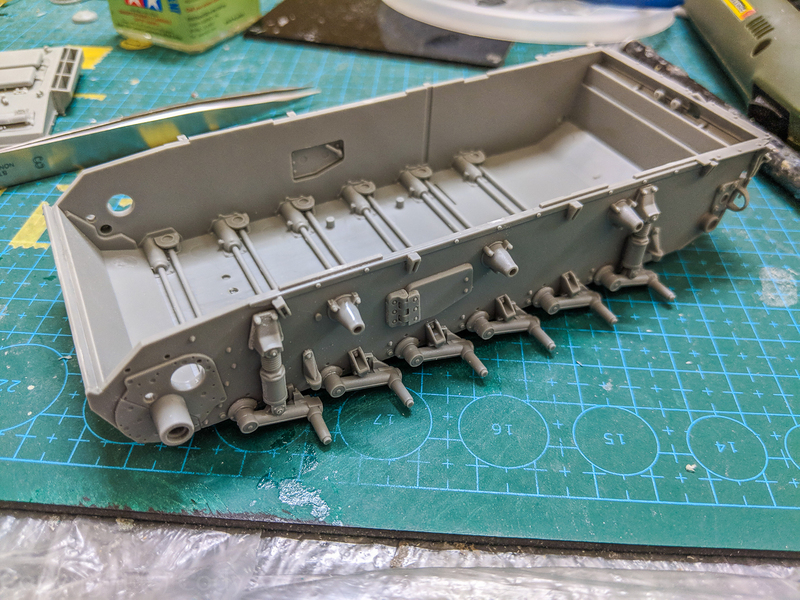 This is my second Dragon kit, since I was really happy with my build of the unreviewed Tiger I 131. The subject isn’t my top choice in terms of coolness, but I got the kit on sale for about $18 so I thought it’s another good kit to practice armor on. This particular vehicle is a converted Panzer III for reconaissance. To make room for crew and observation ports the turrent is completely removed, but to hide the identity of these vehicles they put in place a fake barrel. The paper tiger nature of the tank is what appealed to me. You can read more about the vehicle and the detail of the kit from Dragon’s official page. 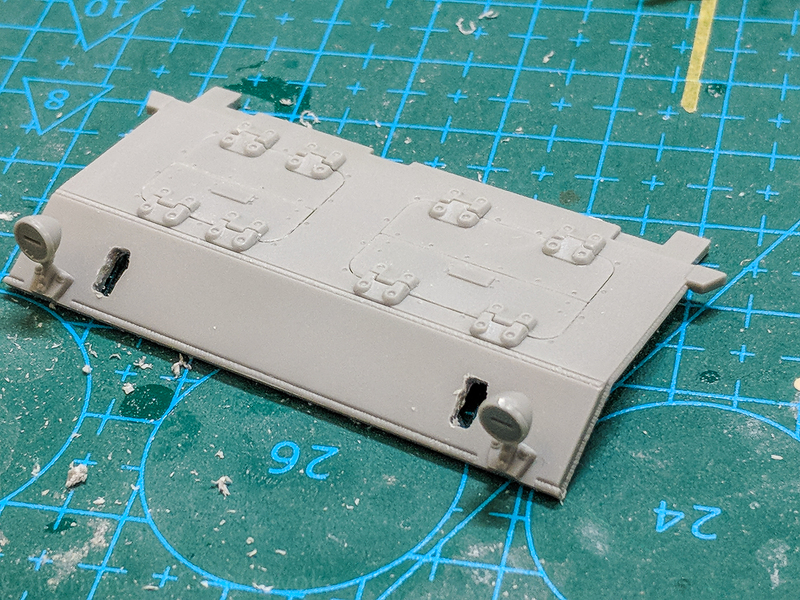 This kit is a bash of many Panzer IIIs and IVs from Dragon, and perhaps the wide variety of sprues were tough to keep track of, so there were tons of errors with the instructions. This build review is quite long. Let’s start! Step 1 was already a head scratcher with the idler wheel construction. I wasn’t sure what the cross section diagram was supposed to convey, but there shouldn’t be much chance for failure if you mate the wheels according to the tabs in the center. I also don’t know why they asked you to glue the suspension etc. with the wheels first, as there was no need to do that. 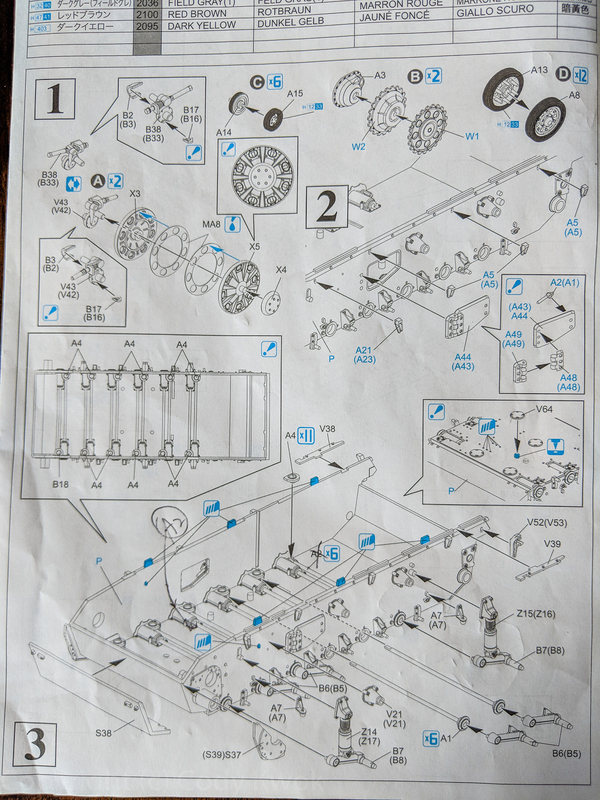 Step 3 was very confusing as they didn’t say where the torsion bars A1 and A2 go. Following the direction of the holes I finally figured out all the A1s are going to the left and A2 to the right. The instruction suggested the final left rod was A2 and that was actually an A1. 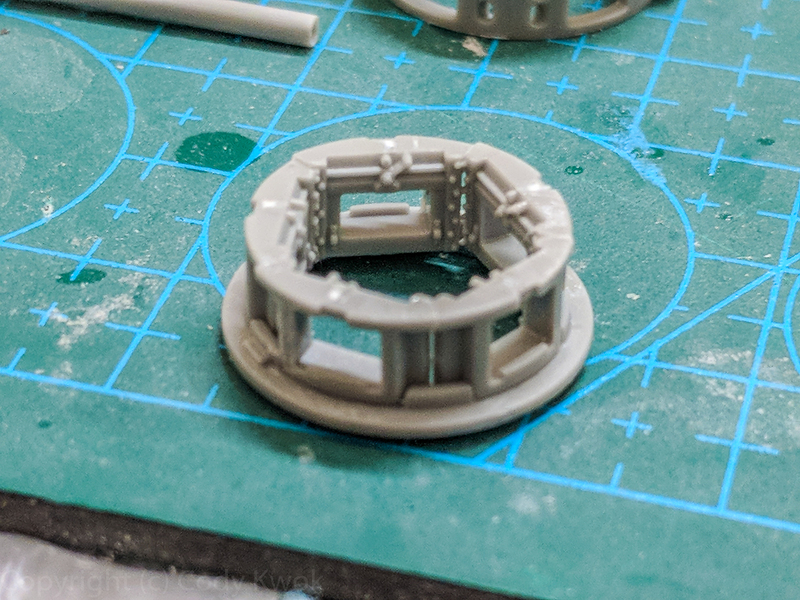 Also the kit has tabs on the suspension to prevent torsion bars from moving, I think you can basically cut them off and have working suspension. I chose to not have them move. Here is the completed lower hull. Next up is the back. 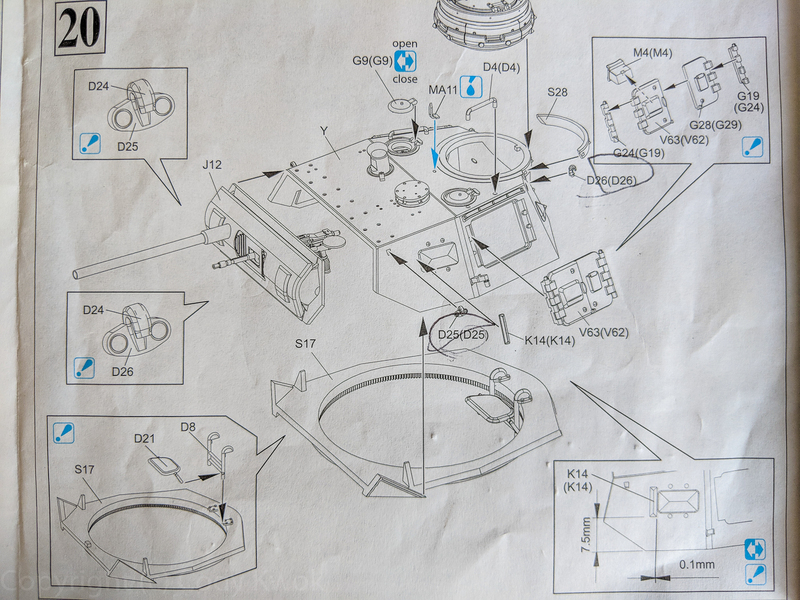 Nothing too controversial here except the diagram in step 6 shows a spurious exhaust dispenser that wasn’t part of this model, must be someone reusing a diagram. 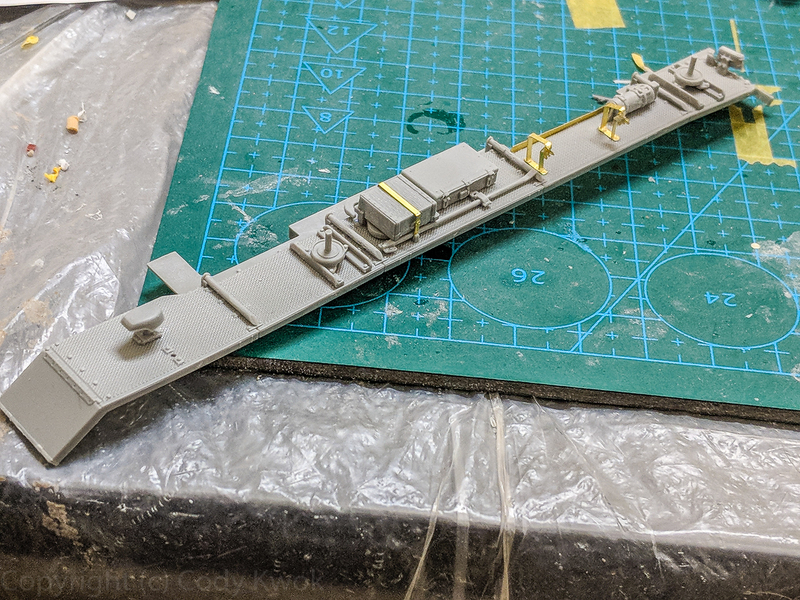 The left platform is quite complicated, in particular the PE jack clamps at the bottom here are very tricky to build as there are very little contact surfaces between parts. I had some fit issues with parts like A54-56, where the square peg hole needed a little opening sometimes to fit in. 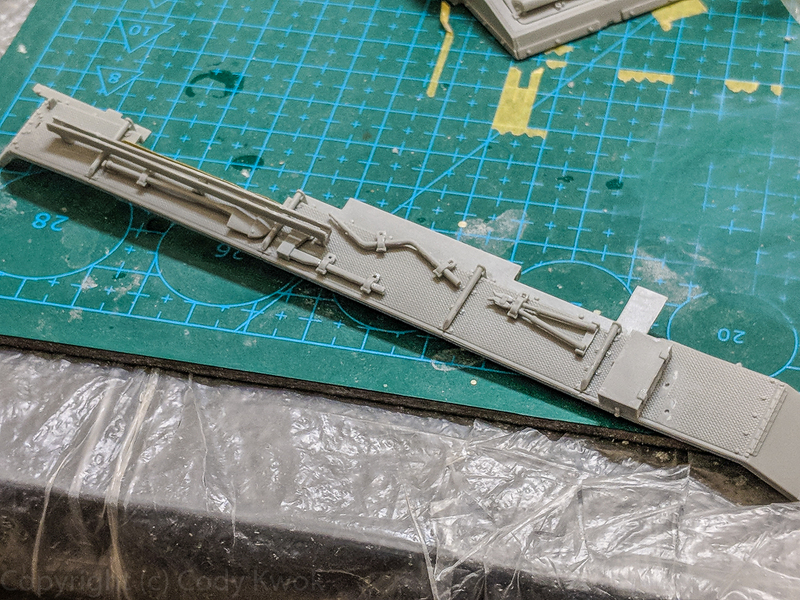 The important omission here is that if you believe you had to attach V39 to the hull in step 3, then the tail end of the B1 has a section that has looks similar to V39 needs to be cut off. They didn’t even draw that here in step 7. You can also choose to omit V39 in step 3, it looks like it might work and I don’t know which version is correct either, but I chose to cut off the section in B1. The right platform has the exact same problem, with V38 interfering with the end section of B12. I cut the latter off. The star antenna is quite difficult to work with because Dragon had them laid out in a fan and ask you to roll it around the shaft. Meng for instance already had the star laid out which leaves no room for error; here you have to carefully adjust the tips. Here is the right platform finished. Here comes the most erroneous step in the build. The diagram is already a mess but with the errors it was frustrating. In assembly (G), 3 of the 4 the engine bay doors are labeled, the missing ones are K17 and K11. I circled V48 and V49 here because they were already used in step 4. My guess was these are supposed to be V13 and V14. If you look at the overhead diagram on the lower right, you have 6 A11s there, but if you look carefully the middle two on each side of the A10 in the middle don’t look anything like A11. In fact they are A4s. Also all the A11s have alignment tabs at the bottom, but because there aren’t any corresponding holes on the engine deck you have to cut them off and just glue them with some eyeballing. The star antenna has a part J110, which is a typo for J10. Here is the completed engine bay. In assembly (K), you don’t glue V58 to V47 because later you get additonal armor added in front of this. 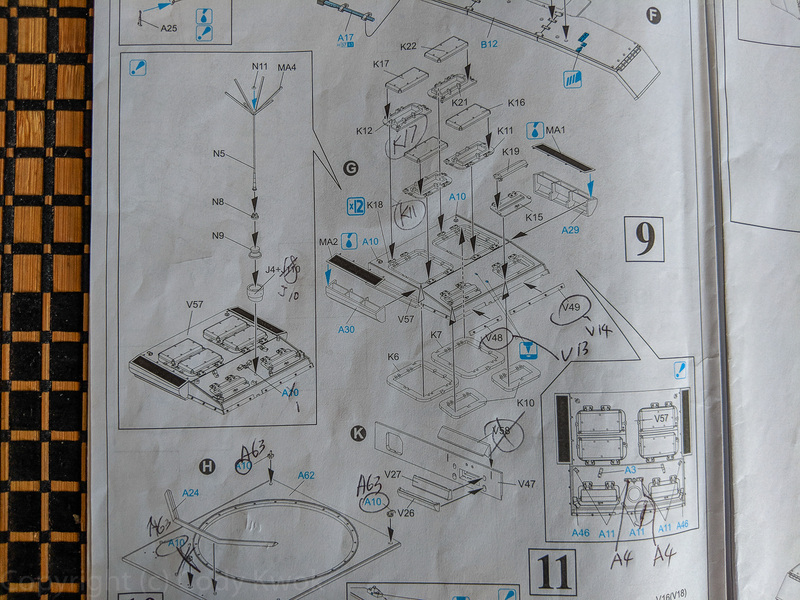 In assembly (H) (step 10), it asks you to add 3 A10s, but A10’s alignment tabs don’t fit the holes in A62. They should in fact be A63 which are these small sharp hooks that should fit. The diagram asks you to add 3, but you shouldn’t add the one in front of A24 because that needs to be cleared for the additional armor plates. Here I didn’t know this and later had to rip the right most hook out. 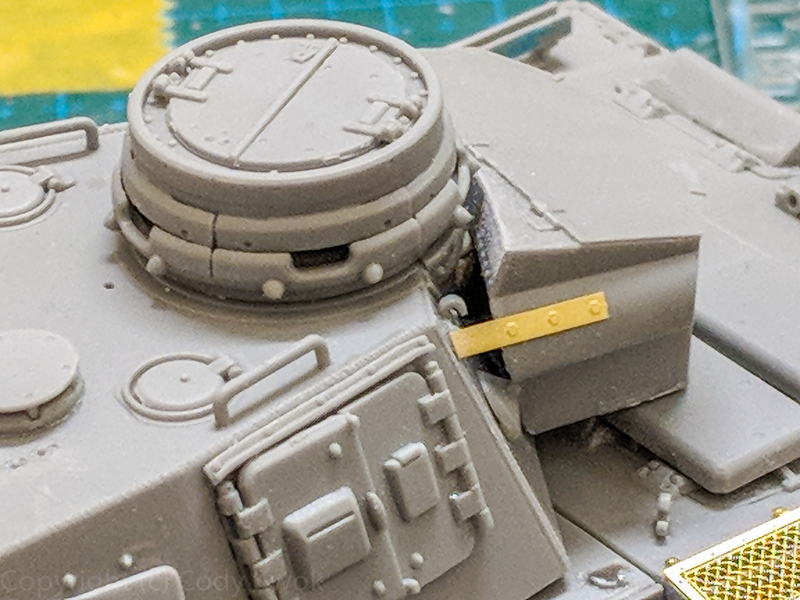 In assembly (J) (step 11), you don’t need to punch out the holes in V40 like the instructions wanted, since the added armor already has the right slots. I didn’t know any better but it’s no big deal, these holes will be covered with armor (U4). Instructions also calls out to drill holes behind the lights, but I find that unnecessary. 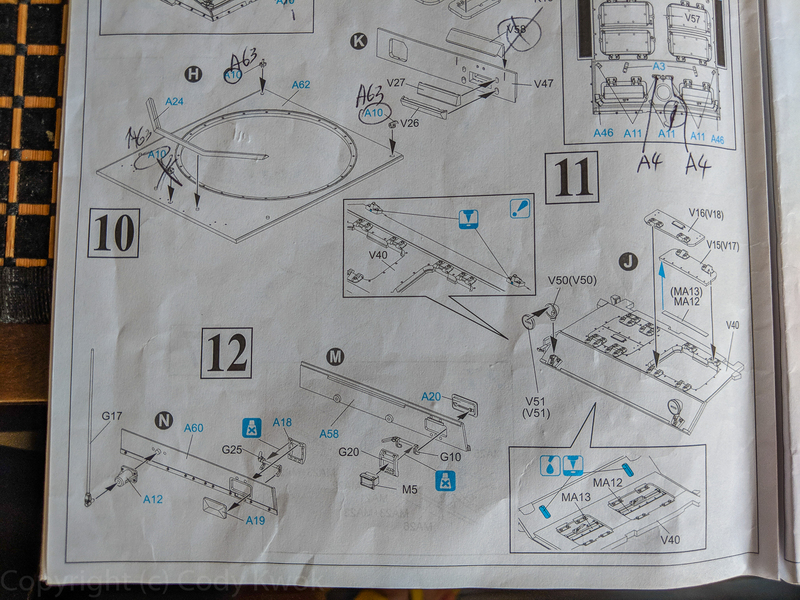 Step 13 is the most complicated assembly of the build. First let’s get the easy stuff out first. The front tow holes assembly V22 – V25 were mislabeled. V24 should be V23 and V25 should be V24. You probably won’t be able to get it wrong because each piece can only fit one way. The pieces MA5 and MA6 are horrible to fit. I think you’re supposed to do all the tow holes and lower plate armor first before fitting these metal plates. 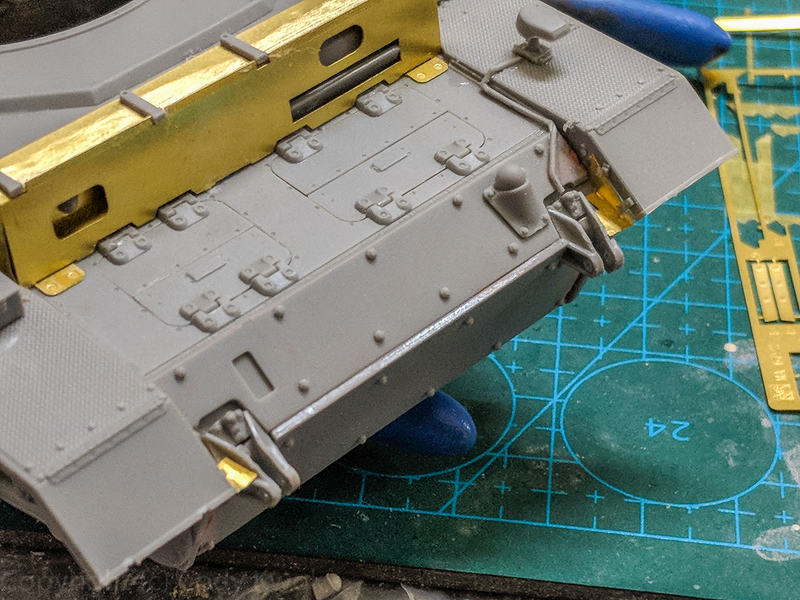 It is hard to understand where MA5 and 6 are supposed to go in those corners, it’d help if you look at the box drawing to see that they are supposed to be covering the gaps between the mud guards and front hull. In hindsight this seems obvious… anyway. 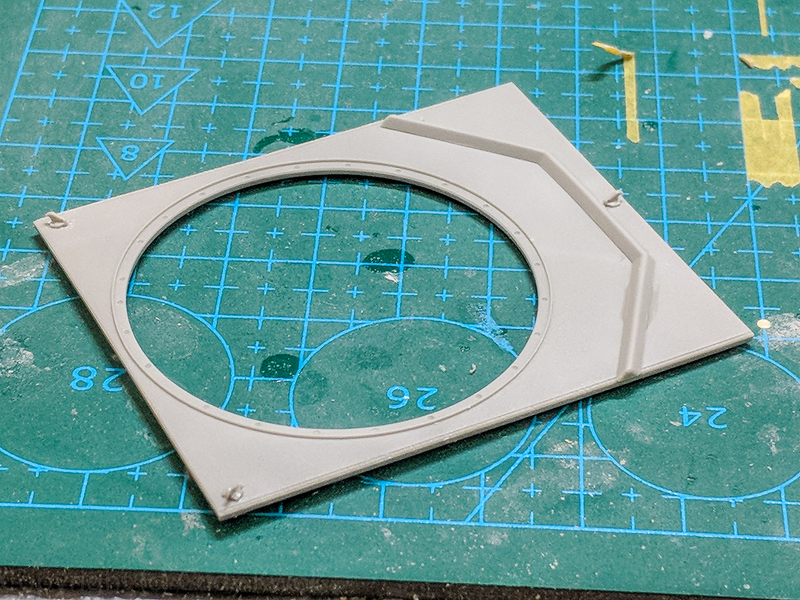 Step 18 has you open a hole on the turrent top for J6. There is an inscribed pattern underneath the piece so you’ll need to cut it out carefully, then fit J6 into it. This is a rather tricky cut because J6 needs to be completely submerged into the opening you cut, and the contour isn’t straightforward, so use some patience and make a precision opening as inscribed. The little hooks D25/26 are a little tricky to install. First the two D25s goes to the front, and D26 goes to the back. I suggest gluing D25 onto the turrent before adding D24, there are more contact surfaces to work with. D26s do not fit into the rectanglar holes in the back of the turrent. I removed the two nubs at the back of D26 and glue them on top of the rectangular holes. 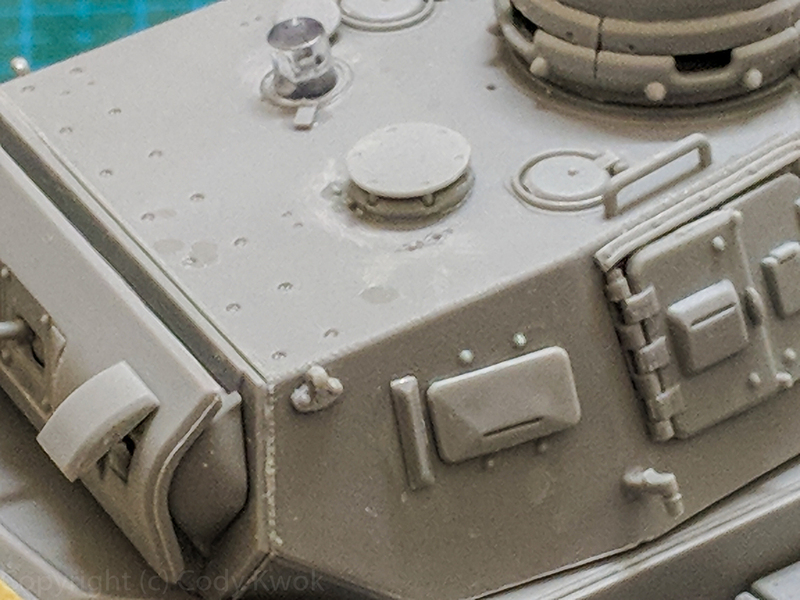 The periscope piece P2 is actually quite cool as they look like predecessors to what we see in modern tank’s range finders. Anyhow, we are at the final problem that is the turrent storage box. The instruction asks you to remove basically the last tab for fitting the box. 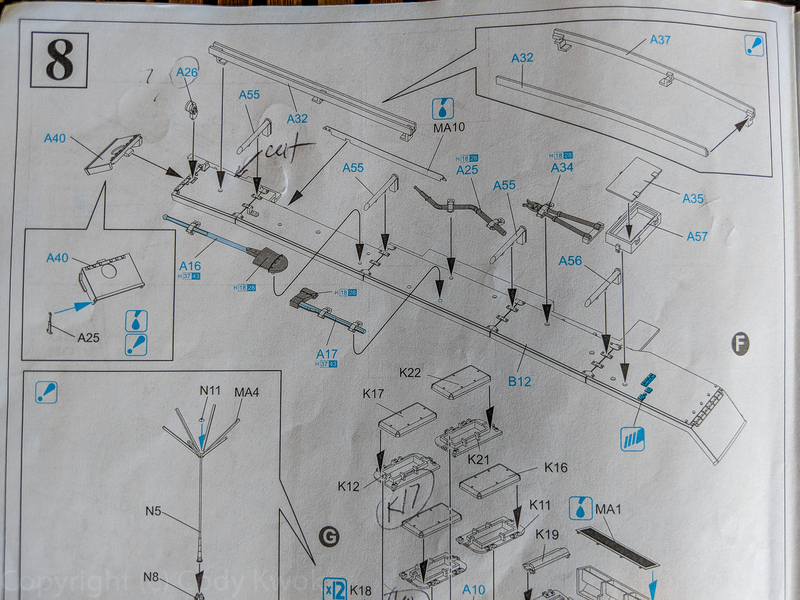 I cannot find a secure way to attach the storage box onto the turrent… the assembly made no sense to me; the PE pieces MA18 and 19 cannot possibly hold it in place. In the end I resorted to using epoxy putty to create contact surfaces. 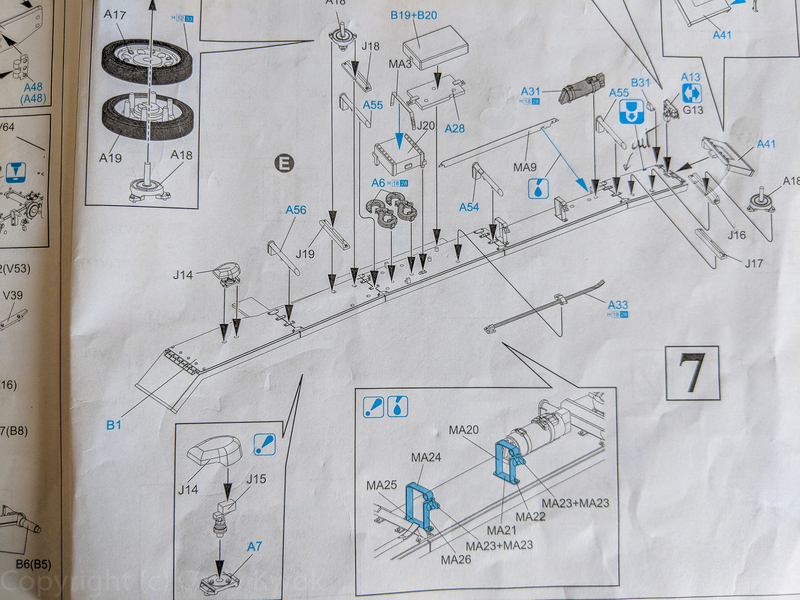 Don’t miss the last addendum they have at the end of step 21, where V36 and V37 goes in the front. 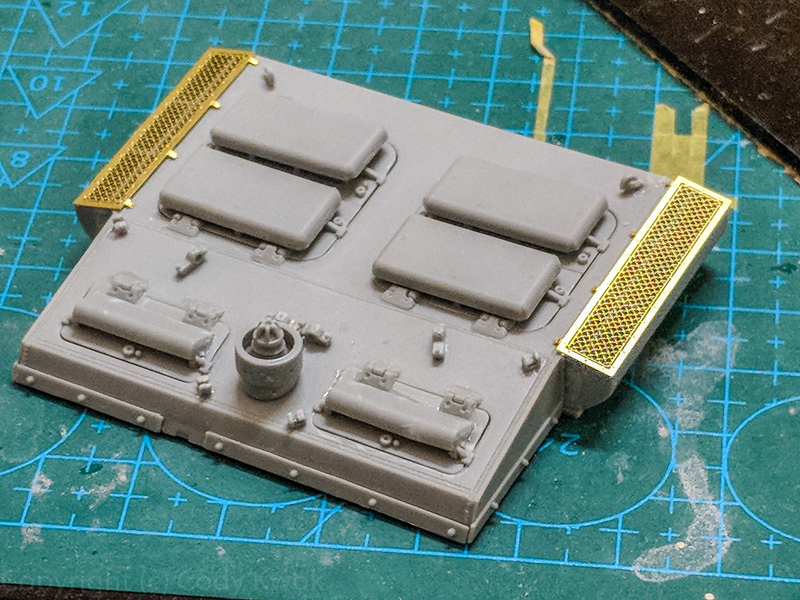 There is absolutely no reason to do this here and not step 13, I was almost going to miss this except when I investigated the whole MA5 fiasco I saw that piece in the box art, so I thought to myself Dragon couldn’t have missed it. Well they didn’t, but you may! V36 and 37 are also quite tricky to fit, I ended up drilling the opening a little bigger for them to fit in. That’s it! There are a couple of open holes on the right and left platforms. 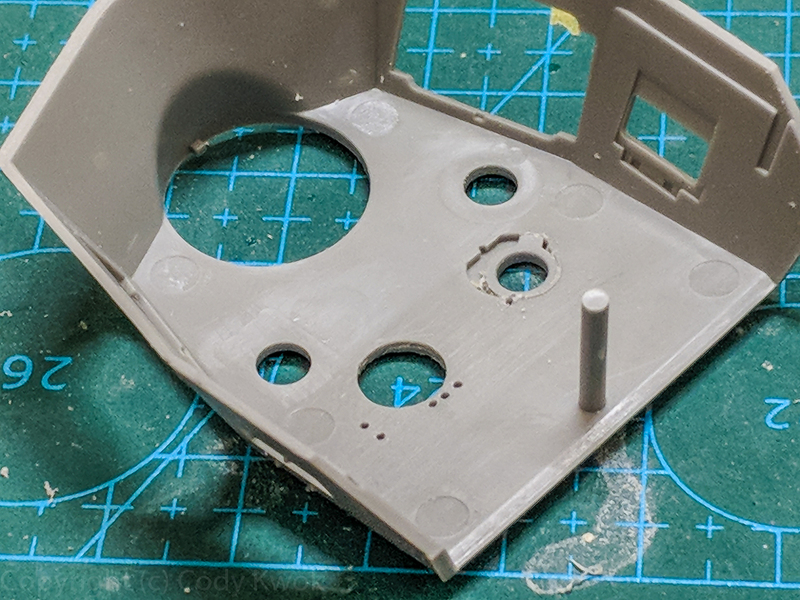 You can fill the holes, but these parts have texture that are hard to replicate; perhaps Dragon just didn’t care enough to do something about them. May be I’ll add a bit of stowage to hide them. I’m still missing a piece here and there at the time this photo was taken, but I added them back after. 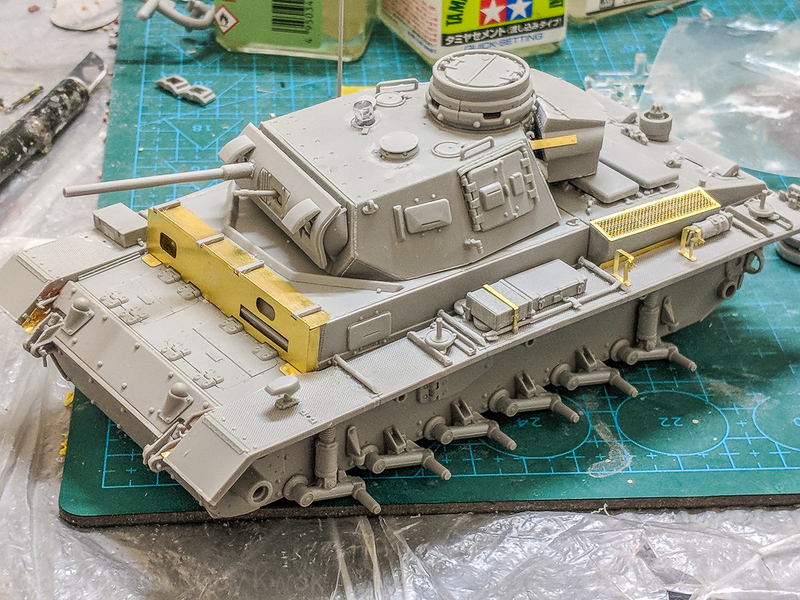 Conclusion: All I can say is this is quite satisfactory a build for a while due to the level of challenge involved… Last time the Dragon Tiger I 131 had some problems but this kit brough it to a whole new level, which I suppose was due to the number of variants involved? 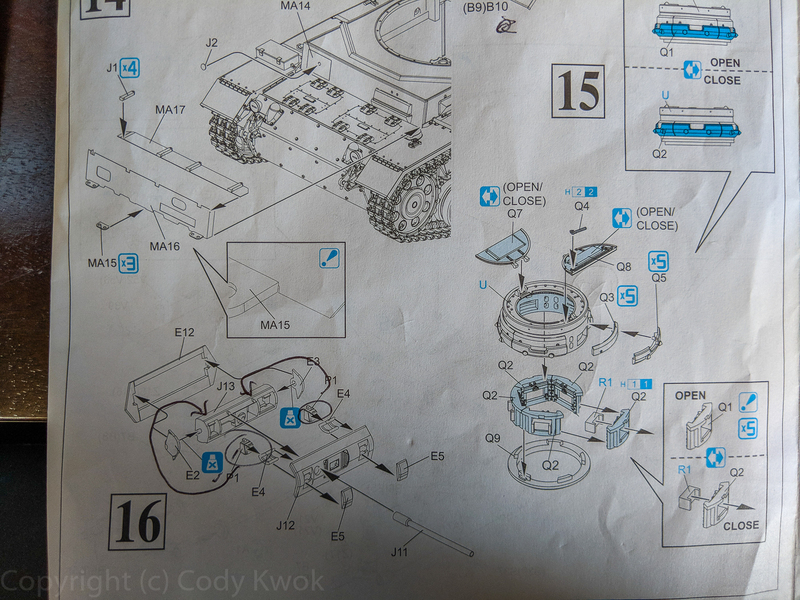 I like the level of details and despite the instructions, the pieces in the box will build you the vehicle. I guess that’s why people had been living with Dragon for so many years. I’d recommend this kit to experienced modelers.